Give yourself one photo or one minute of video to tell a mathematical story so perplexing that all of your students will want to know the ending, without you saying a word or lifting a finger. [anyq] Stacking Dolls from Dan Meyer on Vimeo. This kind of user feedback is invaluable. The results are mixed. There is a degree of consensus around one question but I still may head back to the drawing board to reshoot the problem in a way that makes “How many are there?” the most natural, perplexing question to ask. So I’m pitching the same challenge to you. I have my hawk eyes on the #anyqs hashtag and I can promise you’ll get a question from me, at the very least. You know which group of students seriously doesn’t hate it when you pose intriguing mathematical questions without words? English language learners. I know it’s some kind of cliché to say that a picture is worth a thousand words, but seriously: the more scene-setting you can embed in a photo or video the better for everybody. Consider how bizarre the #anyqs challenge would appear to your textbook’s publisher. They work in a world where it’s totally normal to take some cheap clip art or stock photography and ask a question about it that would occur naturally to nobody else in the world. I’m challenging you to flip every aspect of that around. 2011 Dec 01. Essential follow-up reading. Don’t try to get your students to guess the question in your head. But there’s a certain amount of cultural knowledge at play here. It’s not just language that is a roadblock to ELL students; it’s cultural context as well. Your challenge provides a really, really useful exercise. By pushing us as teachers to try to imagine purely visual launches to mathematical engagement, you stretch our minds and expand our repertoire. Your quest for the perfect image that will get 100% of viewers on board with the same mathematical question may be a bit quixotic, however. Curious about the whole narrative topic you bring it up a lot. Do you mean that the narrative speaks for itself? Or do you offer a story? My question is why is there a doll in front of me, and what makes me care about it? I am just curious as to how the presentation of this clip would look in your class. myself with more vigor. However,I struggle to find good Problems that require polynomial division for example. Do you always start with the “problem” or do you look for problems around a certain topic or tool? Dan – thanks for you talk today, I thought it was brilliant and it was a pleasure meeting you. I have to say that what hit me the hardest was was you said about confusion vs. perplexity. Sometimes in an effort to motivate discussion or inquiry I am guilty of throwing something out to the kids that in retrospect is too confusing. I want to motivate “Act 2” but sometimes I motivate shutting down. The idea of a simple “story” like the tickets or the water consumption graph are certainly the solution. I spent the rest of today thinking about possibilities for compelling and perplex situations. Thanks for all you do. What is NOT worth doing is shoehorning a context into the problems that does not add value to the material. Math for math’s sake can be great if the problems and results are interesting enough. I know the majority of my students would not be familiar with Russian nesting dolls. While this is somewhat more work, how about two dolls? One sequence that shows the complete unpacking, and then another (of different size) with only the first step. This would both more strongly suggest the question you’re looking for and also serve as an explanation for those who have never seen such a thing before. Great post Dan, love the challenge in this, not much to go on, true to your principle of telling them very little. Use all your stuff often and blog on it all the time, give you full credit! Can you elaborate on your confusion vs perplexity comments? I’ve been thinking a lot recently about how confusion is a necessary part of learning, and see the two as very closely related. To me, perplexity is associated with an arousal state, and it contributes to someone taking action, often aimed at geting closer to the object of perplexity. Confusion, on the other hand, is associated with an inhibitory state, and contributes to inaction, or possibly actions that aim to separate oneself from the object of confusion. The difference is one of affect and the different set of behaviors that result. John, I have been looking at the issue of confusion vs. perplexity lately, though I have used other terms to describe this. The difference I see is that confusion ends up in a student giving up while perplexity motivates a student to learn more, to try different strategies, to solve the problem. Think about it in terms of a game. Some games I’ve played are so complex I give up on them shortly into them. I know I’ll never be able to learn them to the point that they will be enjoyable. Other games I’ve played intrigue me. I understand the rules and am motivated to determine a “winning” strategy. I keep trying until I find success, even though that success may come in gradual increments. As long as I am able to perceive that I am moving forward, I happily continue to play. Could you elaborate on the differences between #WCYDWT and #anyqs? Frank: Could you elaborate on the differences between #WCYDWT and #anyqs? Great question. Following the storytelling analogy, #wcydwt is the complete story while #anyqs is only the first act. #wcydwt constitutes a) a conflict that’s clearly, visually, and viscerally represented, which motivates b) the development of new tools, concluding with c) some kind of cathartic resolution. Those are the three acts of #wcydwt. #anyqs is just the first act. #anyqs is an attempt to mitigate the worst consequence of #wcydwt: excessive cognitive load resulting from a unfocused problem space. It happens time and again. Someone on Twitter sees something — anything! — that sends a mathematical sensation down her spine and she tags it with #wcydwt, which other people take to mean, “I should just put this in front of my students and watch learning happen.” Rather, a lot of work goes into the first act (especially) to make a problem that simultaneously converges (to use your term) while allowing for some divergence. #anyqs mitigates against problem spaces that are 100% divergent. I am having this moment where I think you are trying to help us do with WCYDWT what you did with text book problems (like in your TEDx Talk) Decompress the layers. It’s for a different purpose, and the layers are a little different, but still… Do you know what I am saying? @Brian, I’m trying to figure out a useful framework for good curriculum design. Not something that encompasses all good curriculum design, but a framework that encompasses a certain kind of good problem, that’s simple to communicate and easy to practice. The layers from TEDx are a kind of framework, but they didn’t lead to any creative exercises for teachers like the storytelling framework does with #anyqs. We’ll see. There are some topics that lend themselves to videos more easily than others. How would you make a video to teach the Law of Sines or Cosines? What about solving systems of linear equations or linear programming? Any ideas? I’ve always wondered how Dan approaches higher-order polynomials and rational functions. I guess now’s as good a time as any to ask. @R. Wright, I try to take advantage of our natural inclination to seek patterns and make sense of discrepant events. Bowen’s got the pattern seeking covered. As for discrepant events, if you’re my student and you’re amazing at factoring trinomials like: x^2+7x+6. I can write a 2 next to the x^2 term, creating the following discrepant event: 2x^2+7x+6. I’m trying to turn your confidence in your ability with the previous tool into motivation for learning a new one. … flipping open my copy of somebody else’s Algebra 2, I finally understand the topic: students learn to evaluate polynomial functions “so you can model skateboarding participation”, with the number of U.S. skateboarders modeled by a provided fourth-degree polynomial. The number of skateboarders it predicts for 2007, the year the book was published, is -38 million. To verify the skill has been learned, a later problem provides a fourth-degree polynomial model for the number of U.S. -snowboarders- instead. According to the model, there will be more snowboarders than U.S. citizens by the year 2020. 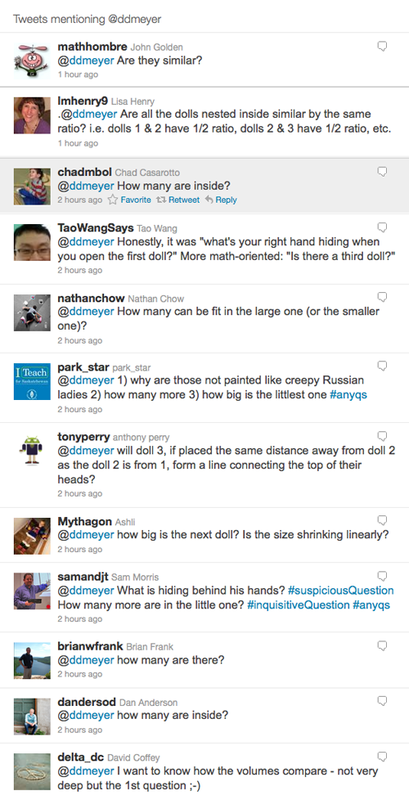 I need to do some writing about the challenges for textbooks to try and incorporate things like #anyqs. It is possible, but I don’t think any text can do it as well as a video or a live experience. IMO The video/image does not so much have to teach the concept, as drive the question of “How could you find…” or “What is the …” or “Why does ….” that motivates finding the method, or applying a technique. Just off the top of my head, ideas for law of Sines and Cosines would involve things like Parallax, or one object eclipsing another, taking two objects of the same size and moving them so that they are at different distances and cast different length shadows. For systems of linear equations, I’d think images with perspective could be an obvious lead-in, or anamorphic images, or optical illusions that appear to be something from one angle, but are different at another. But shouldn’t it be incumbent upon publishers to be thinking beyond the “textbook”? Is there, in 2011, really any good reason that a video/real photograph/other multimedia cannot be an integral part of the school “text”? So far, the only electronic texts I’ve run across have been essentially pdf files of the paper text-sometimes with buttons to press so that things pop out at you. For a very crude look at how things might be different-how an electronic “text” might incorporate multimedia, see an example on Sophia. Here is a story from NPR that might fit this mold. Renowed surgeon/writer for the New Yorker/former senior official for the Clinton campaign/god-like figure Atul Gawande reads from his book ‘Better,’ released in 2007. For #anyqs though, I think the quote the doctor uses to describe the difference between 99.5 probability and 99.95 probability might work in the classroom. It’s compelling and even moving – putting a human face on a topic often taught with number cubes and batting averages. 1. Is the entire narrative essential? 2. Like the Stewart video, I’m not sure if it’s better to have the students verify what they heard the doctor say (the 16% vs. 83% part), to block out what the doctors says, or to just print out the transcript and white out the numbers. The challenge to find an image that conjures up “just one question” might be an interesting workshop exercise for a teacher, to flex those storytelling muscles. But are you also suggesting that those images are then automatically good for classroom use? Why would something that offered multiple paths or evoked different questions be less useful? I would think that (in some classrooms, anyway), that students might come up with several questions, but then the class discussion might be about which questions are the most/least interesting. Or the most/least solvable. Not sure where you’re quoting “just one question,” sylvia. Every student needs to want to know the answer to the question the class eventually poses through consensus. It isn’t important that it’s the first question on every student’s mind. My question, after reading that twitter feed, is “with all of those great questions, why on earth would you want everyone to ask *only one* question?” This leads to more questions: Do you think you can only pursue one question at a time? If so, why not have the kids choose which is the question they want to pursue? But still, why would you think that?? wow, I love the concept, thanks.